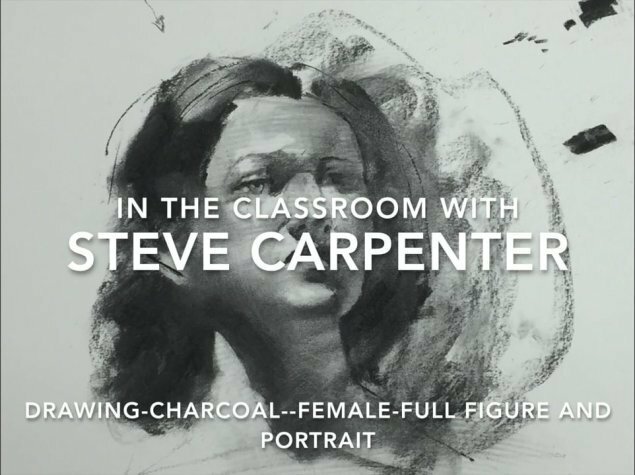 In this video Steve explains charcoal figure drawing to take the subject to and from universe. A primary focus here is to take the form out of the rigid linear pattern and marry it to the background thereby anchoring it in space. Bringing examples of Rubens technique. How background and foreground work together and how to integrate subject into universe and universe into the subject. Detailed demo of the portrait and full figure drawing, showing various tips and shortcuts , use of half tone, darks and lights, how to change pace with form, scale, line, value, drawing the face, hair form, shadow, how to get the portraiture right as it gets smaller when you work it, where to focus 70% of the figure drawing effort, how to find the tip of the nose, how to keep highlights under control, how to visually turn the form, finding knee, belly button, when is enough and how not to overdraw. Steve talks and shows how to effectively use the descriptive line anchoring the final drawing. How to use the eraser to create highlights and light. Drawing the face in detail. This one charcoal instructional video gives the student perfect opportunity to master dozens of charcoal figure drawing techniques.